Philadelphia, PA (November 14, 2012)—The Historic Belmont Mansion/Underground Railroad Museum has been selected as a 2012 Ann’s Love Builds Service Initiative (ALBSI) site. ALBSI, a day-of-service ministry of Media Presbyterian Church, provides capital improvements through volunteer labor. Individuals and organizations were invited to apply for ALBSI through the City of Philadelphia’s Mayor’s Office of Faith-Based Initiatives. On Saturday, November 17th, 2012, volunteers from Media Presbyterian Church (Media, PA) will assist the American Women’s Heritage Society in its preservation efforts by providing much-needed cleaning and organization of the basement (where escaping slaves were hidden as part of the Underground Railroad network) of the Belmont Mansion, the former home of Judge Richard Peters, abolitionist , Secretary of the Board of War during the American Revolution, and friend of General Lafayette. 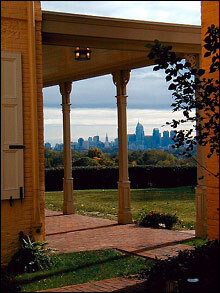 WHAT: The Historic Belmont Mansion/Underground Railroad Museum Selected as 2012 Ann’s Love Builds Service Site. Volunteers from Media Presbyterian Church (Media, PA) will provide much-needed cleaning and organization of the basement of the Belmont Mansion. WHO:	Learn about American History from the house that lived it. Experience 18th and 19th century history through the events and lives of people associated with Belmont Mansion in Fairmount Park in Philadelphia, PA. Our house museum is dedicated to colonial history and the 19th century network of people and places known as the "Underground Railroad." Built in the early eighteenth century, the Mansion is one of the finest examples of Palladian architecture in the United States. The Belmont Mansion property became part of Fairmount Park in 1869, and is now an underground railroad museum and Washington-Rochambeau Revolutionary Route site open to the public (11:00am until 5:00pm, Tuesday through Friday, or by appointment) for tours.